^ a b c d e f g h i j k l m Stern, Jonathan P. (2009). "The Russian Gas Balance to 2015: difficult years ahead". In Simon Pirani (ed.). Russian and CIS Gas Markets and their Impact on Europe. Oxford University Press. ISBN 978-0-19-955454-6. ^ "Gazprom and Statoil sign agreement on main condition for cooperation in phase 1 of Shtokman field development" (Press release). Gazprom. 25 October 2007. Archived from the original on 22 December 2007. Retrieved 26 October 2007. ^ a b Mitrova, Tatiana (2009). "Natural gas in transition: systemic reform issues". In Simon Pirani (ed.). Russian and CIS Gas Markets and their Impact on Europe. Oxford University Press. ISBN 978-0-19-955454-6. 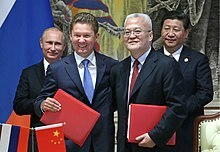 ^ ""Price of Gazprom gas for China not to be linked to Henry Hub index" 5 Sep 2013". Russia Beyond The Headlines ASIA. Archived from the original on 18 October 2015. Retrieved 30 October 2014. ^ "Gazprom boosts natural gas production to solidify top position in Europe". RT International. Retrieved 4 July 2018. ^ Leonid Bershidsky (23 May 2018). "A Fired Analyst Got Too Close to Gazprom's Truth: A report from Russian state bank Sberbank made the bold suggestion that Gazprom is run for its suppliers, not shareholders". Bloomberg.com. Retrieved 24 May 2018. ^ "ОТЧЕТ ОБ ИТОГАХ ВЫПУСКА ЦЕННЫХ БУМАГ". Archived from the original (DOC) on 30 June 2007. Retrieved 28 August 2015.